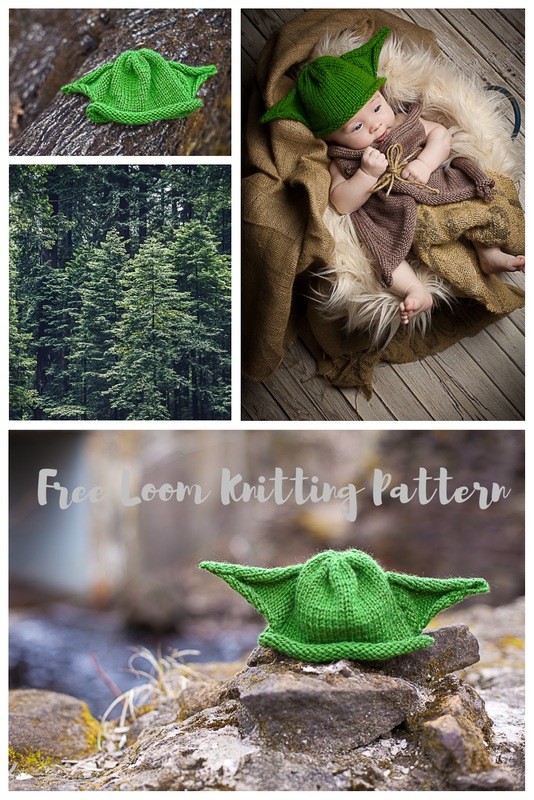 Loom Knit Alien Hat And Robe Pattern (Free) | Loom Knitting by This Moment is Good! 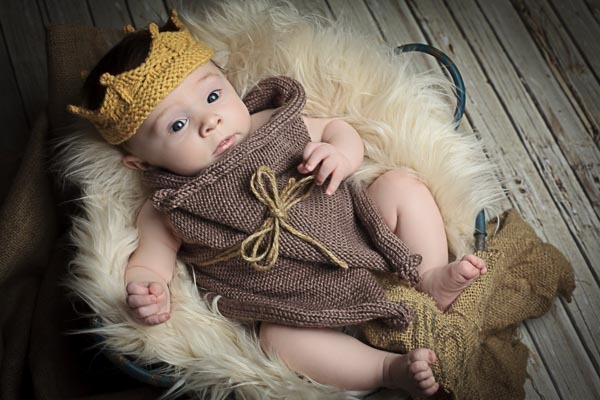 A fun loom knit for baby! My daughter and son-in-law are big fans of this mystical being, so it was just inevitable that I would need to loom knit them a galaxy character set when their son was born. 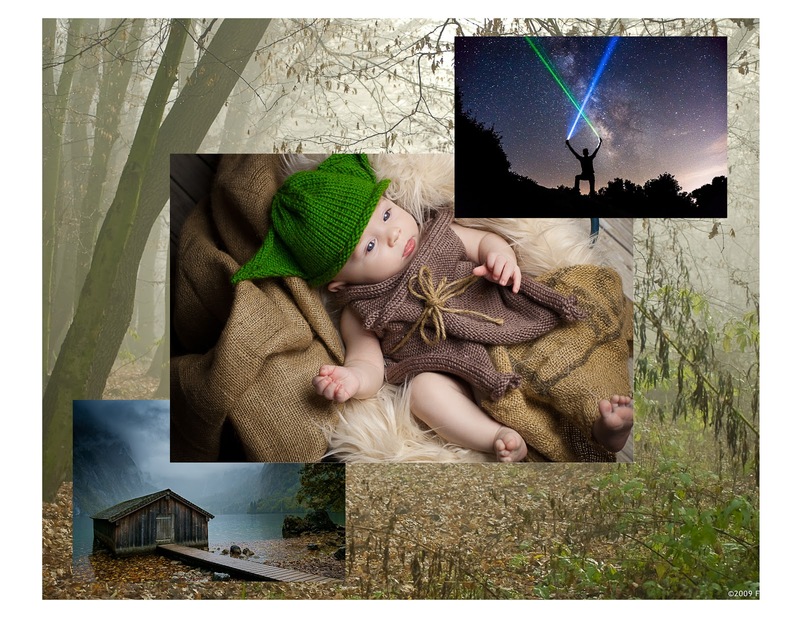 This was a quick loom knit and I have to confess that I didn't give it too much thought when I came up with this photo prop set, maybe there was some "force" guiding me (bad joke, I know). First I made the hat. 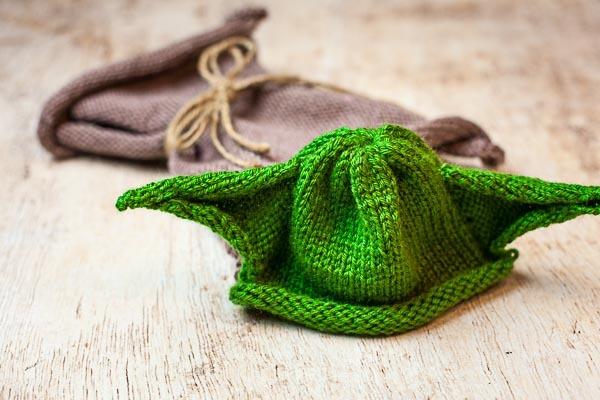 I decided to keep the design simple, allowing the green color of the yarn and pointy ears to be the star. Instead of seaming the ears to the hat, stitches were picked up on the side of the hat for speed. The result was a soft hat that is a super-quick loom knit. Of course, every fighter in training needs a proper robe, so next, I went to work on the robe. Again, I kept the design simple choosing not to do any edge stitches and just let the knitting roll naturally. Jute was used as robe ties to add rustic personality and texture. Overall I'm really happy with the results and I hope you like this pattern too. 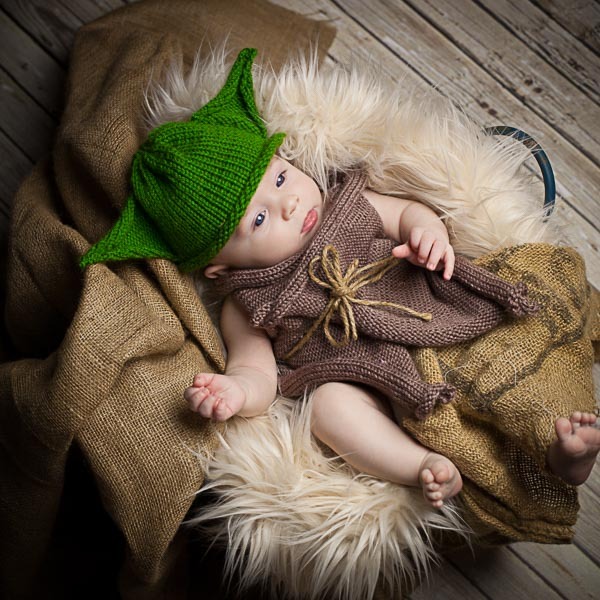 Size: 0 to 3 months; baby in the picture is 11 weeks old, the hat length was slightly short in length so I would recommend knitting to 6 inches+ (hat) if knitting this for a 3-month-old. Gauge: 18 sts and 28 rows = 4 inches in stockinette st (U-knit st). Take the time to check gauge, make adjustments if necessary. MC (Robe): Lion Brand Pounds of Love, 100% acrylic, #4 worsted weight, 16oz/454g, 932m/1020yds. Color: Taupe #125, less than 1 skein. MC (Hat): Lion Brand Vanna's Choice, 100% Acrylic, 3.5oz, Worsted weight #4. Color: Kelly Green, #172, 1 skein. Loom: 3/8" peg spacing loom adjustable with at least 60 pegs. 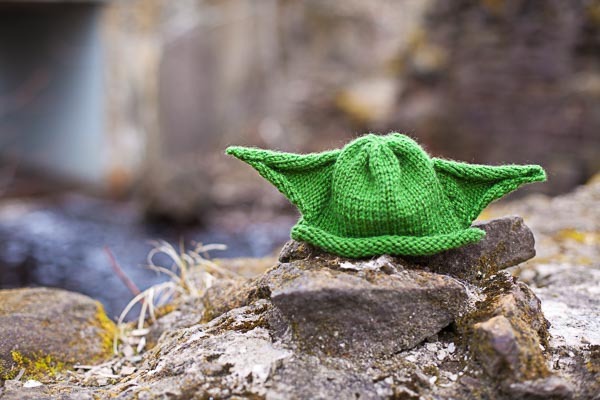 The hat is knit in the round. The robe is knit as a flat panel. The non-public side/or purl side of the ears will face forward when the hat is finished. Keep this in mind when placing the ears. 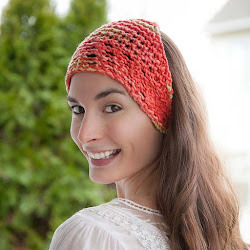 The brim of the hat and ears are designed to curl, no edge sts are needed. Foundation rnd: chain CO 60 sts/pegs with 1 strand MC; join to work in the rnd. Repeat rnd 1 until knitting measures 5 1/2 inches/13.97 cm. Foundation: Pick up 14 sts along one side of the hat. To do this flatten hat and place inside loom sideways. 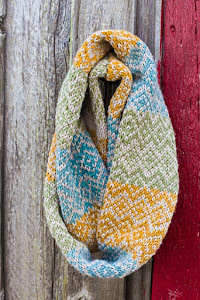 Encourage each stitch open and place it on the loom until you have picked up 14 sts. Row 13: K2tog, u-knit to the last 2 sts, ssk. Rep rows 13 and 14 until there is 1 stitch on the loom. See above for yarn information. The robe is knit flat and in one piece, no seaming needed. Foundation row: Chain CO 50 sts/pegs with 1 strand MC; knit as flat panel. Front panel (A) Keep track of the number of rows that you knit in this section so that both of your front panels are equal. Repeat row 1 until knitting measures 7-1/4"/ inches/18.4 cm. Next row: U-k9 sts, bind off 14 sts, knit to the end of the row. Next row: U-knit up to empty pegs, cast on all empty pegs using the true chain CO, u-knit to the end of the row. Repeat row 1 until total knitting measures 15-1/4"/38.7 cm. 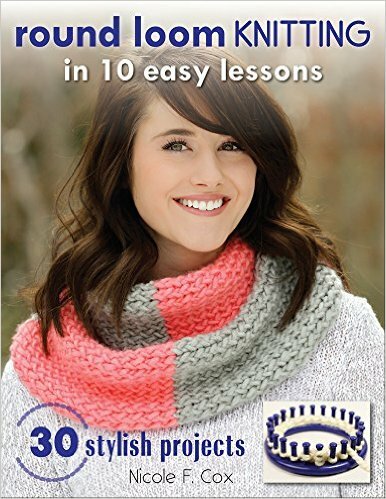 End knitting on the same side as you did the last arm opening. Repeat row 1 for the same amount of rows as front panel A. Chain one bind off all sts. Finish: Weave in ends. Holding 2 strands together as one, tie a bow around the center of the robe. Baby will look adorable in his/her new hat & robe. Please leave me a comment below if you have any questions or suggestions. This robe also looks great with our crown pattern below, click picture for pattern.